After living for goodness knows how long ‘down here’, last Friday night saw the first sortie of Mr & Mrs HC, the Lad and his fair Natalie into the heart of Frome to mark the first night of the Frome Festival with Tom McRae and Turin Brakes at the Cheese and Grain. But first a very honourable mention must go to The Garden Cafe. We stumbled across it quite by chance being strangers in these ‘ere parts. We partook of some most commendable food (and no meat! who would have thought it? ), the Lad using up their last piece-a pizza dough the rest of us with bean and cashew patties, pitta and salad – anyhow decidedly worth a visit – part bistro, part veggie shop and garden. The Cheese and Grain is an over sized village hall of a place capable of holding some 800 souls as it did this night. Despite being later than is my want we still got a decent place up front. 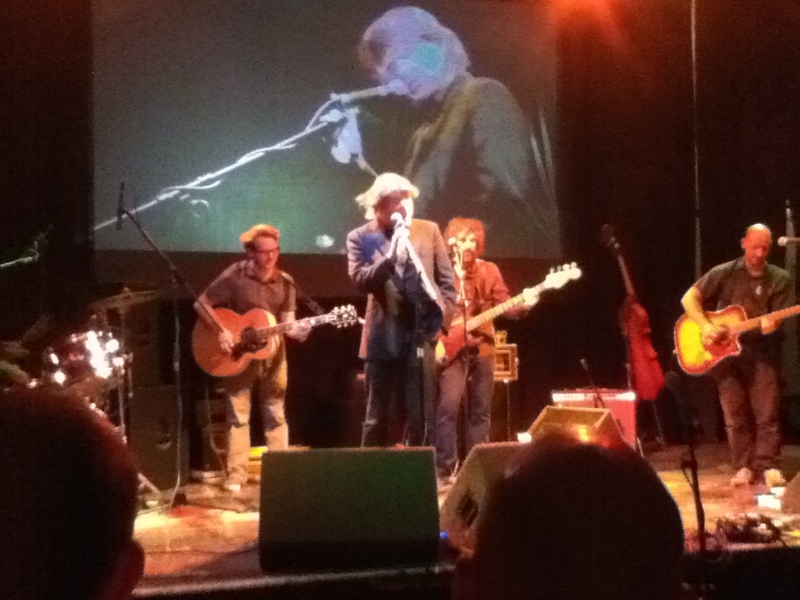 I have been a Tom McRae fan since the get go but somehow had never got to see him live before. I suspect I am irresistibly drawn to the slight whiff of anger mixed with the inevitability of loss – that’s grossly unfair to his oeuvre but you get the drift. In truth he must be one of the UK’s most underrated song smiths, his five albums so far a collection of fine songs. Tonight he technically occupied the support slot but that does a great injustice to his skill, set and performance. Mr McRae and TB go back a way and make a rather brilliant pairing. The set was a sort of best of, only serving to show how many excellent songs are spreadacross the albums. Of course I cannot recall the set list but it opened if I recall with For the Restless from All Maps together with Ghost of a Shark and Line of Fire from Just Like Blood and some welcome reminders of the first eponymous album with Hidden Camera Show, Boy with the Bubblegun and a topically adjusted End of the World News renamed End of the News of the World in celebration of the collapse of that loathsome rag. The crowd had a solid contingent of McRae fans despite his gloomy protestations that only a dozen of us new his music. He got the crowd behind him singing along and the fact that he was one solitary chap up on stage was quickly forgotten. A great little set strengthening my resolve to see him at one of his own shows. After what seemed an age , Turin Brakes sauntered on and proceeded to blow us away for the next hour and a half. They seemed genuinely pleased to see so many out to see them, but I guess many like me have been fans since the early days in 2001. TB were the first band I took the Lad to at Bristol Academy in 2005 and we have seen them many times ever since and they never disappoint, but tonight they seemed at their most relaxed and happy. Olly and Gale were, as so often, accompanied by the Animal from the Muppets look-a-like that is Eddie Myer on bass and Rob Allum on drums (with more than a hint of Nick Frost about him), and ripped their way through their really rather wonderful back catalogue. Hearing stuff from across all the albums you again get a real sense of just how much good stuff they have produced – how come they aren’t more widely recognised as the great singer-songwriters that they are? As I have already established, I am rubbish at catching set lists but along the way were Underdog, Emergency 72 and long-term mortgage paying Future Boy all from the Optimist album, there too were Pain Killer, Stone Thrown and Long Distance from Ether Song; Fishing for a Dream, Dark on Fire and Sea Change from the most recent album Outbursts. A great version of Chris Isaak’s Wicked Game saw Mr McRae back on stage to share vocals with his lyrics on a paper plate. Soon we were into the encore phase – ‘just call us if you want some more’ was the exhortation and back they came, again and again. There was a real sense that they were enjoying themselves and could play all night if allowed – what a change from those bands who do their set, a brief encore and are gone. This year sees the tenth anniversary of The Optimist LP and they will be back out on the road playing it through ( plus some other stuff I hope). Its not always a good thing to go all nostalgic but it is a fine, fine album and well worthy of an extra outing or two. Dates can be found on the TB web site and tickets will be bought for the Bristol Thekla show in November. 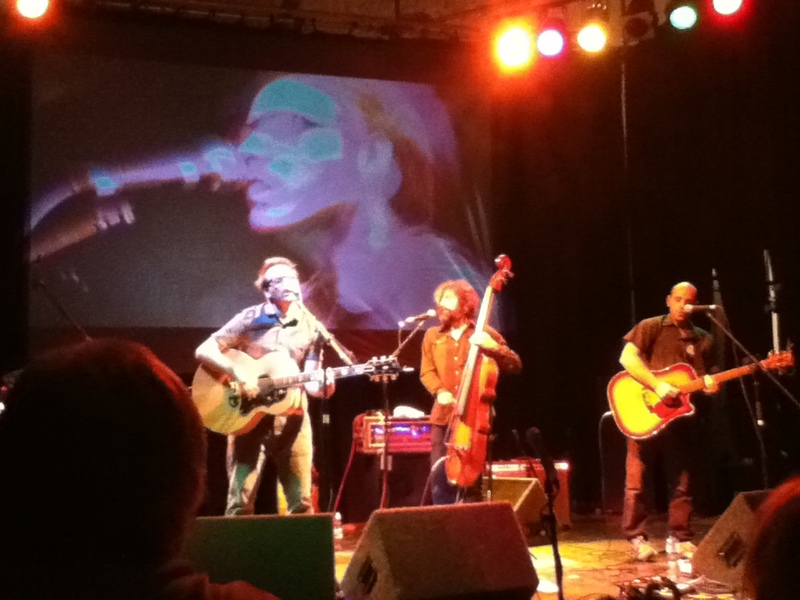 This entry was posted in Uncategorized and tagged Frome Festival, The Garden Cafe, Tom McRae, Turin Brakes. Bookmark the permalink. Excellent post. It made me want to listen back to these great Turin Brakes records.